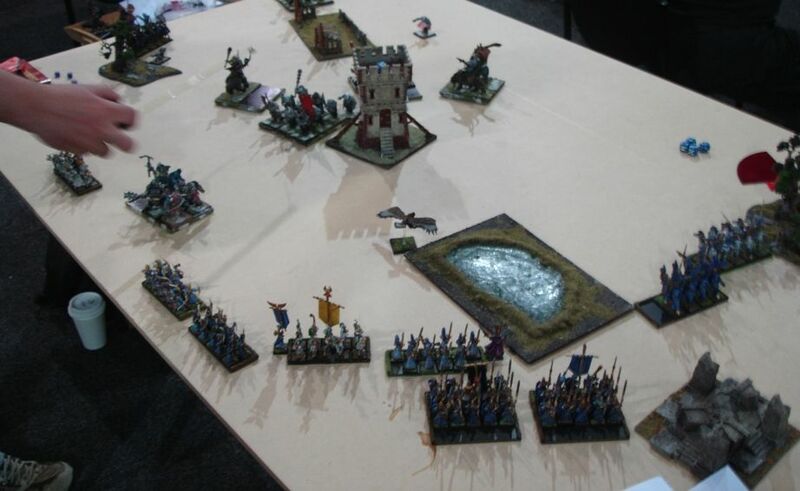 Game 3 of the Day 2 of Wintercon was to be played with modified Blood and Glory scenario. The modification awarded extra 550VP for the player who broke his enemy but the game was to last full 6 turns if possible anyway. This time I had a pleasure to play Garry and his unique army of Ogre Kingdoms. Ogre Kingdoms are considered one of the best armies among 8th edition army books. Very tough and with infamous gutstars and ironblasters they are definitely a force to respect. 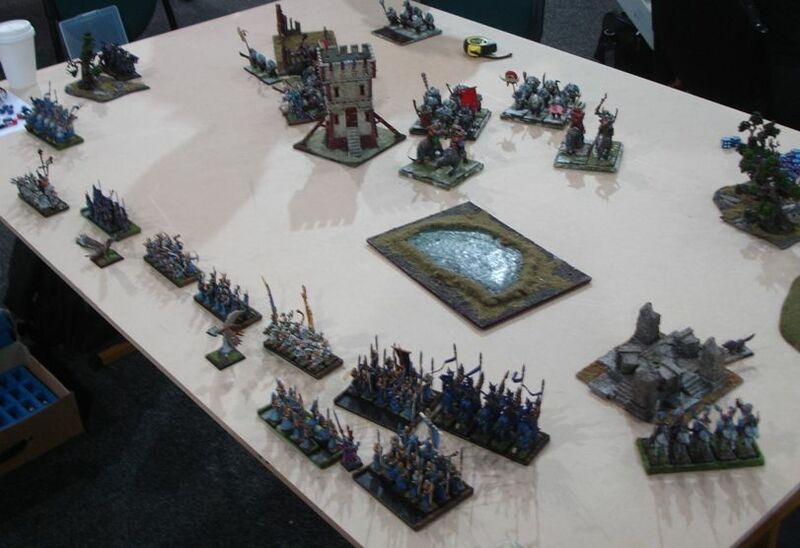 My last game against OK was a disaster and I lost badly at CanCon 2012 also in a blood and glory scenario.This time I had one standard more, also for this occasion but I was glad a I have a chance for some kind of a rematch. When I saw Garry's army I initially thought it is a similar force to any other, with a horde of Ogres and 2 units of Mournfangs. I was, however, wrong! Very fast and hard hitting force, especially on the charge with all these impact hits. In particular, Ogre units are able to pack S6 impacts if at full strength. 3 fast and well armored Mournfangs units are also very dangerous as they can quickly close the distance to my shooters in particular and grind them down easily. Although not as powerful as a single unit, 4 Mournfangs strong, with a Dragonhide banner, they are much more flexible and can all attack as one if there is a need. 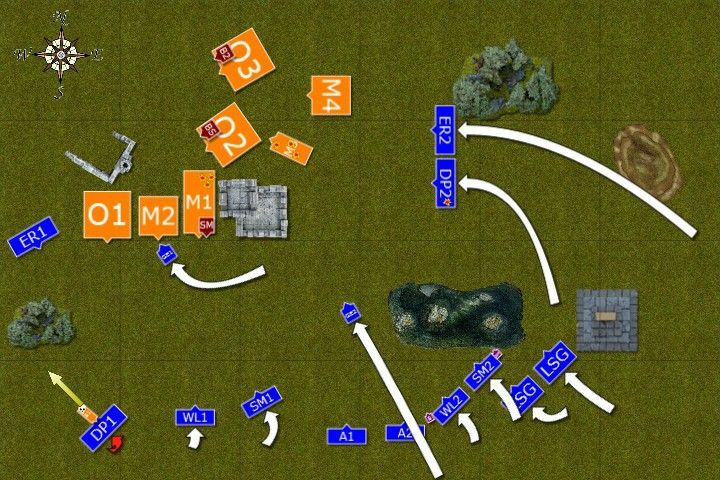 With so many regiments my advantage in the movement phase was definitely much smaller as it could have been against more traditional OK army. In terms of scenario I knew the first thing I needed to do is to protect my standards so I wanted to place majority of the units and characters away from main force of the enemy if possible. So that I could make it more difficult for them to reach me while at the same time spreading their formation. I would also be able to shoot at them longer. Although OK units are tough every wound counts, especially when I could take away 1 model as it means less impact hits or at lower strength and also one point less for combat result. I was confident that with focused shooting I could inflict enough damage to make inevitable combat more favorable for me. As usual I lost roll off to see who has the first turn and Ogres moved first. Ogre army moved forward at full speed. 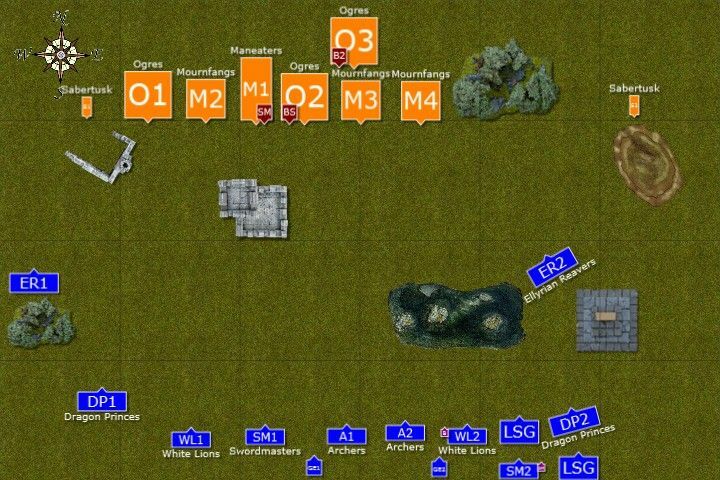 Mournfangs on the Eastern flank attempted to charge elven light cavalry but could not catch swift riders who performed their famous feigned flight maneuver. Sabretusks run towards enemy ranks too, ready to disrupt enemy advance. 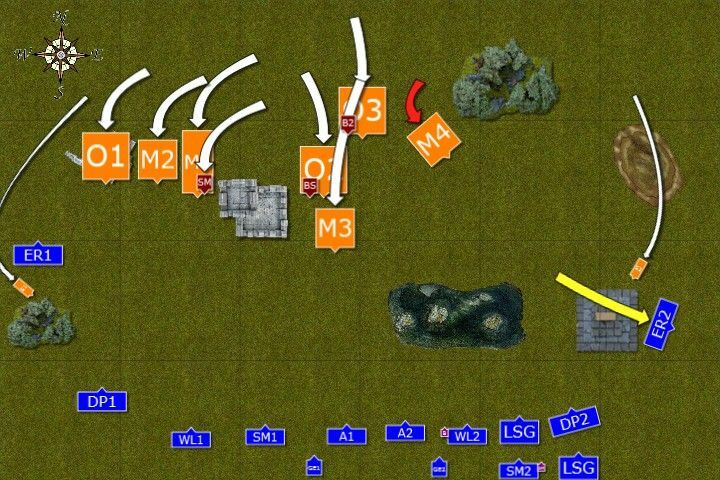 Elves moved regiments on the East to outflank the enemy. Shooting and magic resulted in killing one of the Mournfangs closest to the elven lines. Light cavalry tried to hunt down sabertusks but somehow their arrows could not hit the target. Meanwhile, regiments on the West waited patiently for the enemy. Ogre regiments, clearly intimidated by Elven shooting, retreated to the West. 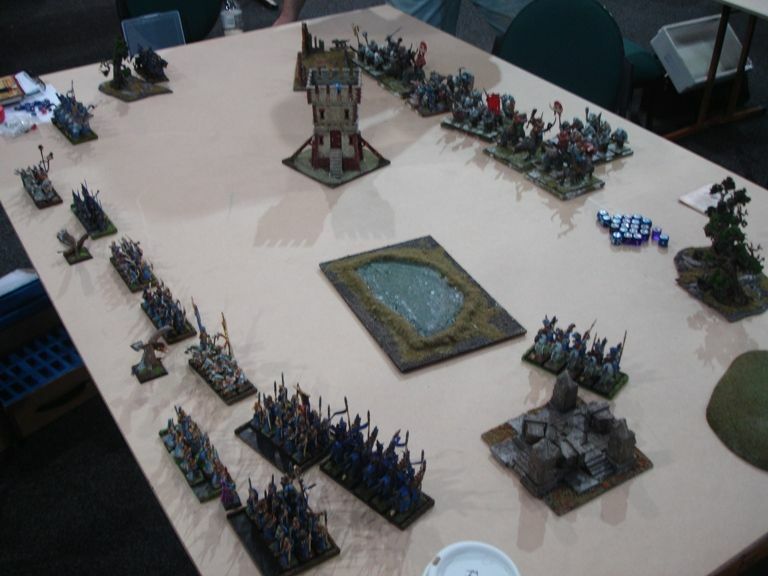 Other units advanced slowly, not wanting to get into charge range of elven regiments. Only Sabertusks moved boldly, one of them blocking Dragon Princes while another charging the flank of the second heavy cavalry. However, wounded Sabertusk was pierced in mid-air by elven lance before it could finish its attack. Seeing a dramatic change in the enemy tactics Elves responded quickly. Cavalry on the East moved towards the foe at full speed (Dragon Princes lost one of the knights in the difficult terrain in the process) while other regiments swiftly redressed their ranks. Archmage managed to kill the second of the Mournfang cavalry but nearby Ogre troops were not impressed. BSB shot down another Mournfang from the regiment on the Western flank while Archers aimed at Maneaters and killed one of them too. Dragon Princes chased off another Sabertusk which fled to the woods and was hunted down later by the reavers. 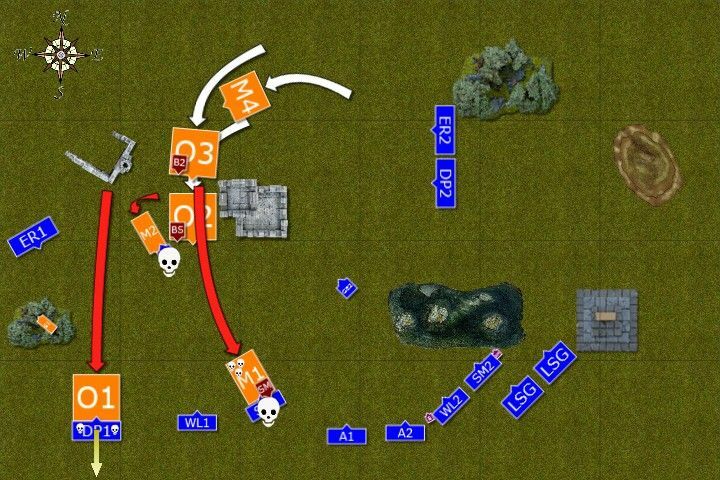 Ogres decided it is time for an attack and made all the long charges they needed to make. 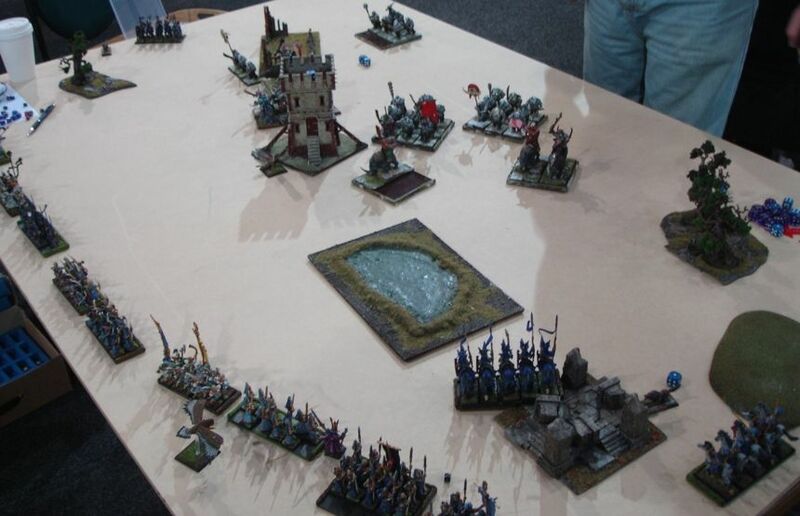 Ogres hit Dragon Princes hard and elven knights could not withstand the pressure and fled pursued by hungry brutes. Mournfang killed an eagle blocking its way and Maneaters led by Slaughter Master attacked Swordmasters. Warriors of Hoeth killed one and wounded second Ogre but were all butchered in return. Victorious regiment reformed. Can White Lions break stubborn Maneaters? White Lions attacked the rear of Maneaters and wounded them badly but Slaughter Master prevented more damage to be inflicted and a few Lions died too and Maneaters remained stubborn. Shooting was not efficient enough this time and elven arrows could not kill yet another Mournfang. 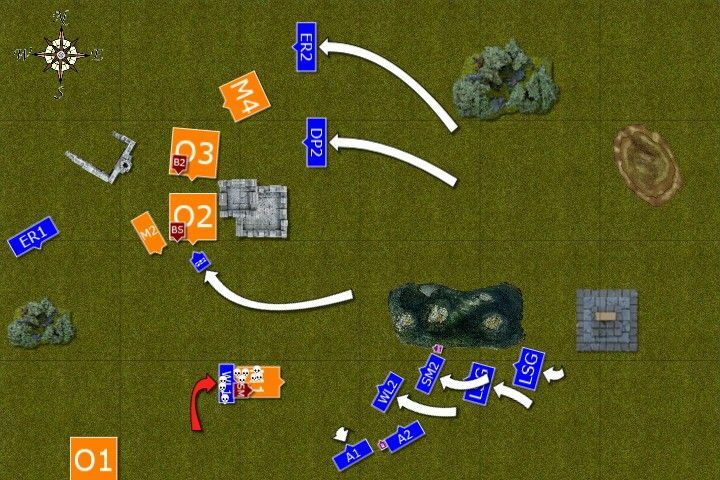 And then some magic storm erupted, regiments from both armies barely saw anything and unit captains decided to disengage and regroup rather than blindly hacking at shadows who might turn to be their friends. Well, I was yet again surprised that the game ended so quickly as the referees announced "dice down". It is a pity as it was last game of the day so we could have at least half an hour extra and I regret we had no chance to continue as I think some interesting things could have happened. Instead we calculated points for few regiments lost and it turned out I was down by more than 100 points which gave Garry 11-9 victory. Let's have a look at what could have happened if the game lasted at leas one more turn. 1. Single Mournfang and BSB would have charged Lions fighting Slaughter Master and Maneaters. I am not sure at the moment but there was either one of the Ogre mercenary left or two but badly wounded. I am sure I would lose the Lions but then I had a good chance to kill Maneaters before they died. 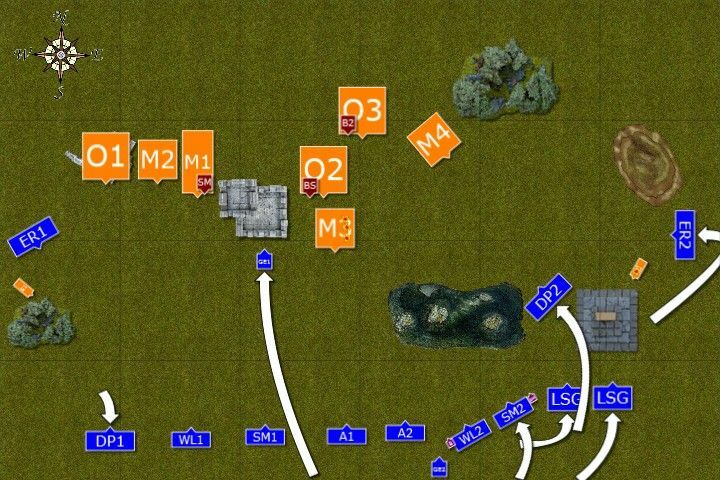 Ogre regiment would return after pursuit of the table but they would have been in the second line and not be able to contribute directly to the fight yet. 2. In my turn I could charge in again with another Lions and there were some interesting targets there. Slaughtermaster with or without Maneaters, single Mournfang, lone BSB. All of them could suffer from that charge especially if I were to cast Vauls Unmaking on the Slaughtermaster to destroy his 4+ ward save. 3. On the North there might be a chance for Dragon Princes and Reavers to charge third unit of Mournfangs too. By no means easy victory or even a victory at all but given the opportunity to charge them instead of being charged I would do so. I also didn't show that on diagrams by mistake but since turn 3 Butcher was on his own too. 4. Finally, I could also aim some bows again at other targets and who knows, maybe score some more important hits. It all shows that the game was finished before it really started and although it was not guaranteed I could win it back at least some action would have happened but I had no opportunity to make it due to lack of time. There were some things I would have done differently regardless of the short game we had. 1. Deployment - as always it is a crucial stage. 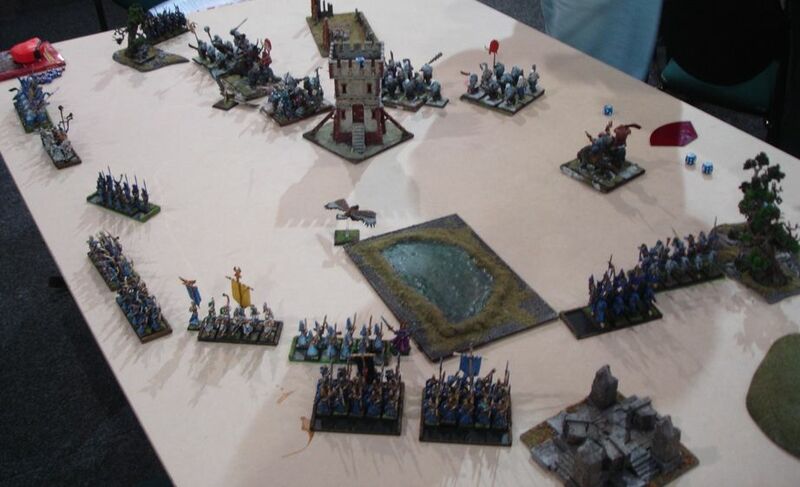 I managed to protect my banners and characters but it seems I had them too far away and shorter range of LSG bows meant they could not add them to the fire when Ogres retreated. Also, a good protective maze turned out to be a trap as it does not hurt Ogres that much as single wound units. Having the opportunity to pick the sides I should have chosen North where I could deploy similarly but without slowing down my units. 2. I didn't position Reavers on the West properly so that Sabertusk could run past them and then I didn't turn them enough to let all warriors to shoot so it was still alive and diverted Dragon Princes. They should have left it alone and withdraw again thus increasing the 8+ charge into 10+ one for Ogres which was far more likely to fail. I didn't have much of a chance to held against that charge when it hit home anyway. 3. I might have done the same with Swordmasters and Lions, instead of shifting them to the front I could pull them back one more time. Another option would have been to position eagle in front of Maneaters and approach more aggressively with Lions towards Mournfangs and Swordmasters to the flank of Maneaters. 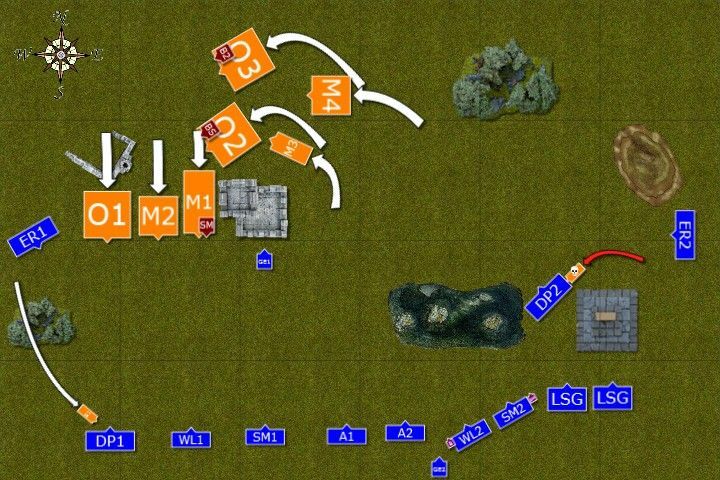 Maybe even block the Ogres with Light Cavalry so that they could not charge Lions either. 4. Even when Maneaters charged I thought it is a good exchange. I didn't expect Swordmasters to survive. With impact hits, 14 attacks total (and "only" 6 support attacks from the rear rank) as well as stomps they had little chance to stand. But I still had 14 attacks on my own and I think I was a little unlucky to kill only 1 maneater and wound second one. Swordmasters and Lions later had a good chance at killing 5 Maneaters thus giving me points for a unit and maybe even breaking the Slaughtermaster. 5. I was wondering if I should have attacked with second unit of Lions with BSB among them at that time. It was 8+ roll to get them in though. Maybe if I payed attention to warnings about time and risk that roll ... but I did thought it is not good yet to charge in, lose BSB shots and put him in danger for next turn. Still, 11-9 against OK is much better than 19-1 I got last time I played against them so there is a progress. :) As I said, the only thing I regret is that it could have been much more interesting game if it lasted just on more turn, no matter what the end result would have been. Also, congratulations to Garry as he was 2nd at Wintercon with his unique OK army!